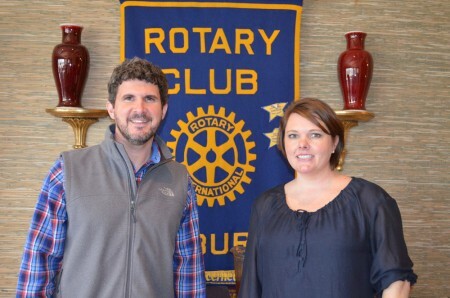 Local author Chad Gibbs visited with the Auburn Rotary Club about his recent book, Love Thy Rival. A follow up to his first book, God and Football: Faith and Fanaticism in the SEC, Love Thy Rival explores the most intense rivalry games in sports and observes the darker side of fan culture – from the cross-country culture war of Lakers vs. Celtics to the cross-state hate-fest of Alabama vs. Auburn. The book ponders the problems rivalry games present to the Christian fan when called by Jesus to love thy enemy, but feeling compelled by the sport to hate thy rival. Learn more about Gibbs, who is pictured with Club President Martee Moseley, at www.chadgibbs.com.